She may be a regular in the Sunshine Coast’s glittering social scene, but there is much more to Natalie Tink than just a pretty face. Make no mistake, this award-winning, self-made businesswoman, wife and mother-of-two is the real deal. Natalie Tink has always been a risk taker, a can-do kind of girl. Even at the age of 17, the plucky teenager jumped head first into a position selling national advertising for a real estate publication to fund her overseas travel. Little did she know that just four years later she would become a partner in the business and a few years after that, the sole owner. “I had just come back from the UK and there was a telemarketer role advertised in the newspaper for Coast to Coast magazine. I had never done anything like that before but I wanted to make some money quickly so I could go back to the UK, and I thought I’ll give it a go,” says Natalie. “I was invited in for a trial and I remember everyone working there was much older than me. I had never picked up a phone to do this type of thing but I sat down, was given a script and was told to jump on the phone and ‘see how you go’”. Turns out Natalie was a natural salesperson, and rapidly climbed the ranks from this entry level position to become the company’s top sales person. “I just started talking to people, and after two or three phone calls someone bought an ad off me and then I sold another and another and the owners at the time said, ‘Okay you can come back tomorrow’. Natalie was just 21 years old when she was offered a partnership in the publication. “I had come as far as I could with the business, I was bringing in 80 per cent of the sales and I needed a new challenge. I was offered a position with The Weekender so I went in to give my notice of resignation and came out with a partnership instead,” says Natalie. Coast to Coast media went from strength to strength with Natalie and her business partner at the helm, relocating to a stylish new commercial office in Kawana (owned by Natalie and her husband Brad) as well as many production changes. At just 30 years old, Natalie was recognised for her outstanding work and was awarded Sunshine Coast Young Business Woman of the Year in 2012. 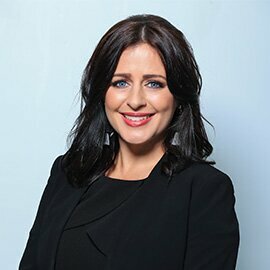 A self-confessed overachiever, Natalie is always looking for the next challenge, so when the opportunity to become sole owner of Coast to Coast media presented itself three years ago she jumped in boots and all. 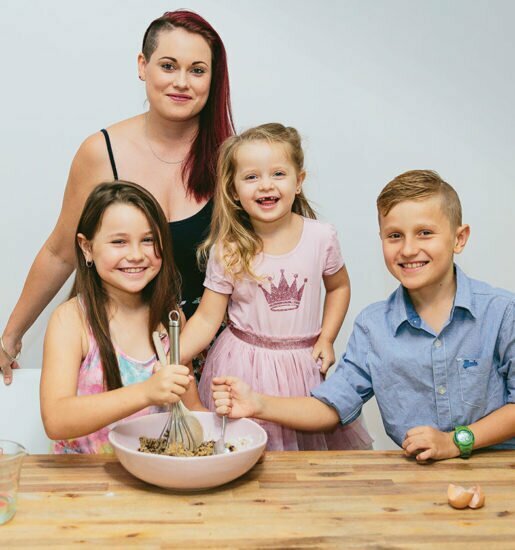 Like all businesses, there have been challenges along the way and she now juggles the day-to-day operation of the magazine with raising two gorgeous children, Kooper, seven and London, two, but Natalie wouldn’t have it any other way and says her secret to success is to “keep calm and carry on”. That’s not to say it has all been a bed of roses, far from it. In fact, the first few months of motherhood really tested Natalie’s resolve and she developed crippling anxiety. “It was one of the toughest times of our lives,” says Natalie, reflecting on the memory. “When Kooper was born, I anticipated I would take six months off work, however the manager we hired didn’t work out and resigned the day I gave birth. That was really hard and took a long time to bounce back from. I felt robbed, that time had been taken from me. But it wasn’t long before Natalie’s steely resolve to succeed no matter what kicked in and she picked herself up and realised she simply had to let some things go. Five years later, daughter London came along and the juggle of work, daycare, school and running the family home was pushed to new limits. Thankfully, seeing her through it all has been her biggest supporter, her husband and business partner Brad. It’s refreshing to hear Natalie candidly open up about the daily juggle working mothers face and she is the first to admit when it comes to having it all, she is still working towards the perfect work/life balance. I literally high five myself. “I think you can have it all but not everyday. I’m a long way from having it all. I think appearances are a funny thing because you can look like you have it all but cry the entire way home. I have mother guilt to a whole other level. Just when you thought this woman’s life could not possibly get any busier, she also finds time to exercise every single day and prepare healthy meals for the week ahead. I know right! “Since I started exercising, my life turned around. I can take so much more on my plate if I train. “The truth is I don’t love fitness, a lot of people think ‘wow she is so active’, the trick is doing what you love. I don’t like the gym but I love working with a personal trainer outdoors during the day. I love how it makes me feel afterwards. It’s also the only release I have, that’s my time. The rest of the day is spent on the phone selling and marketing, I am still extremely hands-on. That’s not to say Natalie doesn’t enjoy a champagne or two! In fact her motto is, “Start the day with a smile and end with a champagne!” And when she’s not working hard in her business, she loves nothing more than sharing her love of all things fun and fashion through her colourful blog – where she is affectionately known as Mrs Tink! “I just started writing when London was born, as a hobby, and it has morphed into something I never imagined. I just love the blog. It’s the fun part of what I do. It was never meant to turn into what it is, there was no master plan, but I have had some really good opportunities land on my lap and I have even more plans for it in the future,” says Natalie. And there were some big lessons learnt along the way too. “I have now learnt to leave the office at the door. We don’t talk about work at home. It’s taken us years to achieve it but if you don’t take a break you start to resent your work and the time it takes from your family. “The one thing I learnt a couple of years ago was not to compare my family and my situation to anyone else. Brad and I have an agreement that we break all the rules and we do it our way. It’s so liberating to say that. It’s giving each other permission that it’s okay to not live the stereotypical way. Natalie and her husband Brad are showing no signs of slowing down either, just when you think they have reached the pinnacle of success, the dynamic duo is about to launch their next business venture and if their passion and enthusiasm are anything to go by, it’s going to be one hell of a ride. We can’t wait to see what you have in store next Mrs Tink!